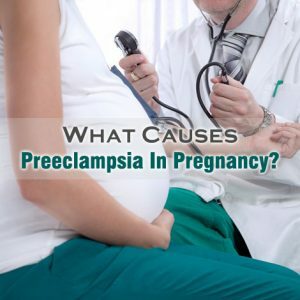 Are you looking for what causes Preeclampsia in pregnancy? Then let us first have a look at few details about Preeclampsia before that. Preeclampsia is one of the complications that occur during third trimester of pregnancy in which high blood pressure, and large amount of protein in urine is observed. This can result into swelling and albuminuria. The swelling occurs in the feet, hands and the face and albuminuria involves the leakage of protein albumin into urine. Preeclampsia generally occurs in the third trimester affecting around 1 in every 20 pregnant women in the world. Any definite cause for this condition is not known till date. However, experts are of the belief that this condition starts in the placenta which is the main organ nourishing the fetus throughout pregnancy. So, What Causes Preeclampsia in Pregnancy? In early pregnancy, new blood vessels start developing and evolving to transfer blood to the placenta efficiently. Women, who experience preeclampsia, do not have these blood vessels developing properly. In such women, the blood vessels tend to be narrower than the normal blood vessels and they react in a different manner to hormonal signaling limiting the blood amount flowing through them. This abnormal development of the blood vessels might be the result of damage of the blood vessels, insufficient flow of blood to the uterus and problem with the immune system. Some other causes of preeclampsia in pregnancy include problems of the blood vessels, autoimmune disorders, diet, genetic factors. Some other causes that can increase a woman’s chances of suffering from preeclampsia during pregnancy include being pregnant with number of fetuses, being pregnant in early teens, being pregnant after 35 years of age, first time pregnancy, diabetes and kidney disorder. The causes of preeclampsia need to be managed and done away with effectively; otherwise they can sometimes turn out to be dangerous.